A very fragrant bottle gourd curry bursting with flavour from aromatic spices, tomatoes and herbs. Sweet potato added to the curry gravy makes a creamy base with a hint of sweetness. 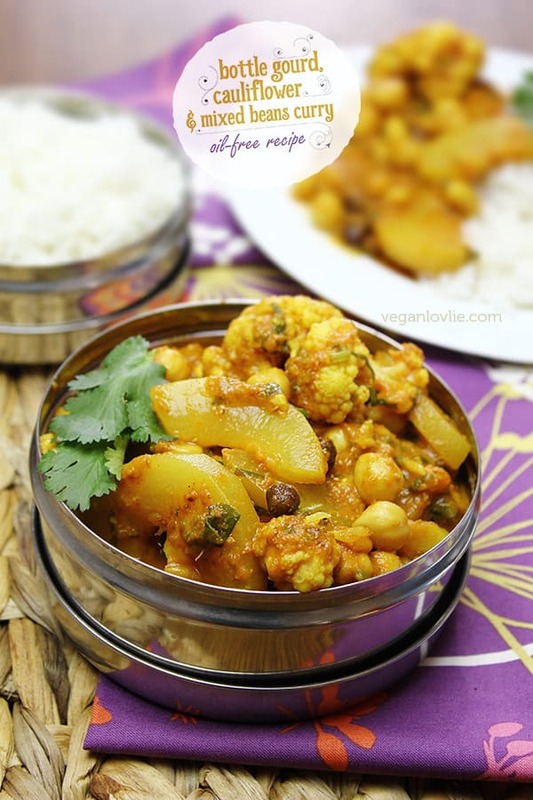 This vegan curry is also oil-free. 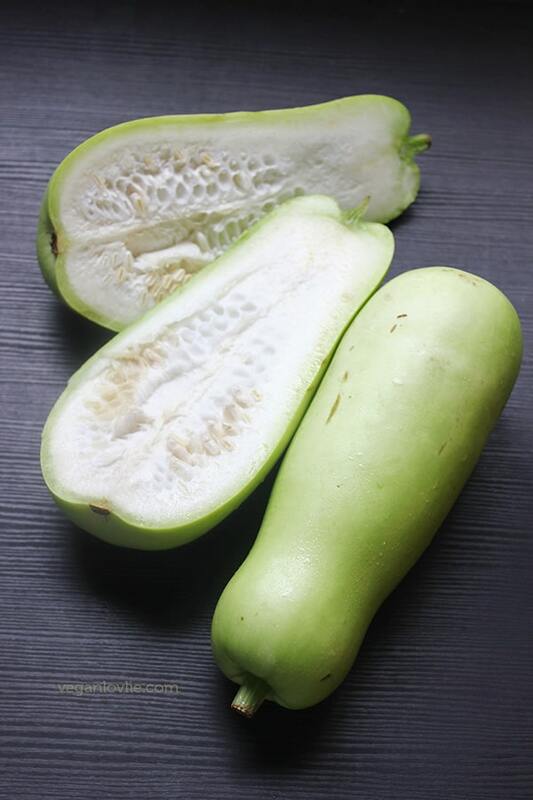 While a common vegetable in Africa and Asia, bottle gourd is not all that well-known or common in the Western World. In Mauritius, we mostly refer to it as calabash (or calebasse) even though calabashes are actually not gourds. The calabash is mostly round (which I have not seen before) while the bottle gourd is elongated and come in various thickness. This gourd is quite bland on its own with a very subtle peppery taste. The texture is quite watery and feels like something in between a zucchini and a cucumber, although when cooked it does remain firmer. 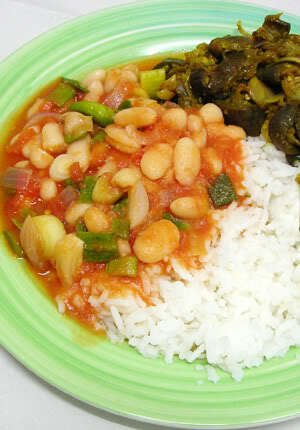 In Mauritius, they are commonly added to stews and curries or very often braised and prepared Creole style. I love this vegetable in all types of preparation; even the skin is not thrown away and is used to make tasty chutneys. The bottle gourd is easy to prepare. The skin is thin and can easily be peeled with a vegetable peeler or knife. It has a spongy centre where the seeds reside. Depending on how tender the gourd is, you may leave the seeds in or remove them along with the spongy part. Then it can be sliced or cut into cubes and added to recipes. While it depends on how tender the gourd it, the amount of time it takes to cook is usually somewhat close to cauliflower. When choosing a bottle gourd, you would preferably look for tender ones that feels a little heavier. The mature ones are generally lighter and have larger seeds. In this bottle gourd curry, I have added a selection of chickpeas and beans. You can use any beans that you like. 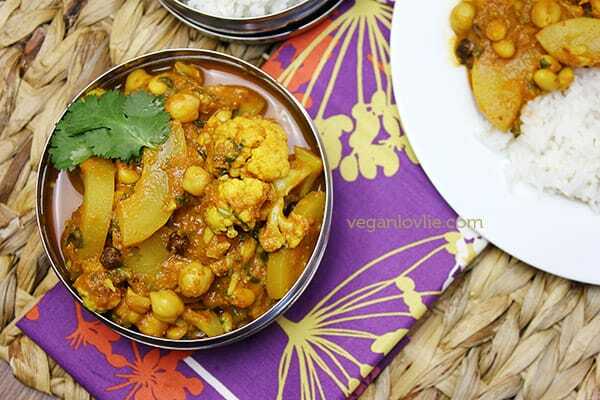 I particularly like the combination of brown chickpeas with the bottle gourd as I find that their earthy flavour marries the hint of pepperiness from the gourd perfectly. You may substitute with red kidney beans for something close. In this video, I explain the easy step by step process of how to make this Bottle Gourd Curry. Peel and cut the sweet potato into rather small pieces. 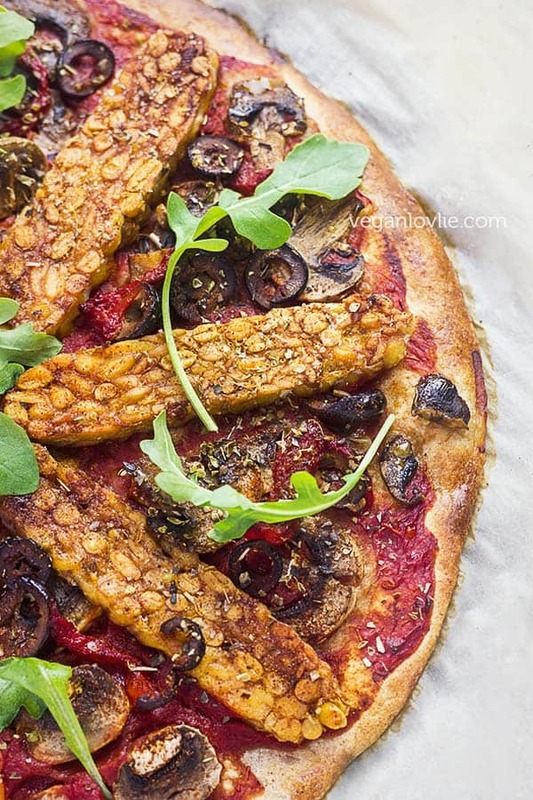 Place the sweet potato in a heated pan with a little water. Cover and let cook until soft. Once cooked, remove from pan and set aside. While sweet potato is cooking, prepare the other spices. We are going to roast the fenugreek and coriander seeds to release more aroma from them. In a heated skillet or nonstick frying pan. Add in the coriander seeds and fenugreek seeds and lightly toast for about 1 minute or less. Transfer to a blender. Add all the rest of the curry spice ingredients to the blender, including the cooked sweet potato, and blend for about 1 minute or until all seeds and spices are finely blended. Wash and peel the bottle gourd. Then cut it in half lengthwise. Depending on the size of the gourd, you may need only half of it. (Keep the rest to use in another recipe). Remove the soft part where the seeds are. 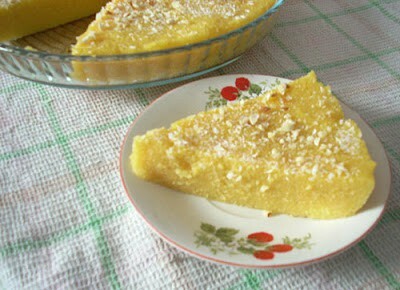 If the seeds are tender, you may leave the soft spongy part in. Cut into thick slices. Cut the cauliflower into florets. Add the cauliflower in the nonstick pan. Add the bottle gourd and sprinkle with a little salt. Cover and let the vegetables cook until they are soft. This should take about 10 minutes. Once cooked, remove all the vegetables from the pan and set aside. If you are using zucchini instead of the gourd, do not add the zucchini at this stage. Keep it for later. Add the spice gravy into the nonstick pan and let it simmer uncovered for about 15 minutes on medium-high heat while stirring. Hold the lid or a splatter guard to avoid any splashes or the risk of burning yourself. After 15 minutes, the sauce would have reduced. So, add about 1/2 cup of water (or adjust consistency to your liking). Then add in all the cooked beans and vegetables. Mix and stir well. Cover and simmer for another 10 minutes. Adjust the salt and sugar. Garnish with some chopped coriander (cilantro). Serve warm on a bed of basmati rice or with your favourite naan bread. 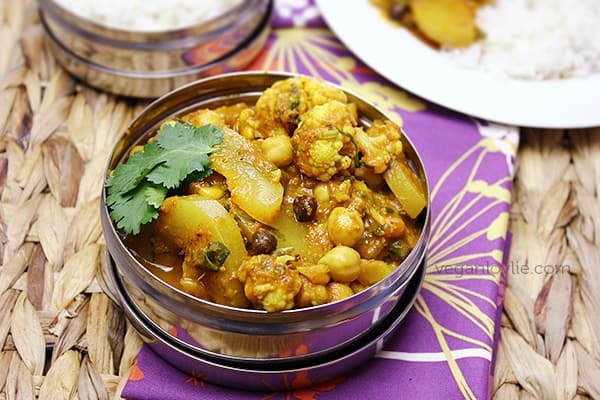 A very fragrant curry bursting with aromatic spices and herbs. Bottle gourd makes a tasty vegetable in this curry but you can also substitute with zucchini. Enjoy with rice or naan/roti. While sweet potato is cooking, prepare the other spices. We are going to roast the fenugreek and coriander seeds to release more aroma from them. In a heated skillet or nonstick frying pan. Add in the coriander seeds and fenugreek seeds and lightly toast for about 1 minute or less. Transfer to a blender. Add the cauliflower in the non-stick pan. Add the bottle gourd and sprinkle with a little salt. Cover and let the vegetables cook until they are soft. This should take about 10 minutes. Once cooked, remove all the vegetables from the pan and set aside.